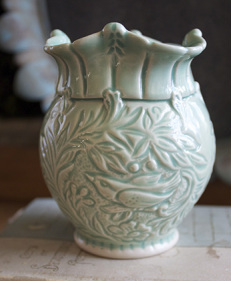 Each one-of-a-kind piece is wheel-thrown and hand-carved in graceful, botanical motifs. 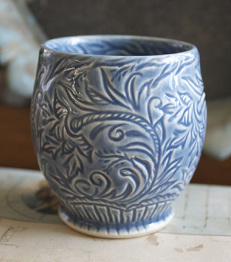 Glazed in a quiet palette of non-toxic, food-safe glazes, ware brings durable elegance to everyday use. To preserve the life of your piece, avoid temperature extremes such as refrigerator to hot oven. Copyright 2014 Grace DePledge. All rights reserved. No portion of the work, photos, or statements may used, copied, or transferred electronically, without prior written permission from the artist.